Easter is three weeks away, but we’re already celebrating with Sweet Cadbury Egg Cream, a combination of our traditional Italian-style Fior di Latte/Sweet Cream Gelato and Cadbury Mini Eggs. These tasty little nuggets are made of solid milk chocolate and coated with a crisp sugar shell. Master Gelato Chef Carl crushes them up and folds a generous amount of them in. We’ve already gone through two pans of Sweet Cadbury Egg Cream Gelato! Hurry in and try it before it disappears for good! Come Celebrate European Artisanal Gelato Day with Red Rock Gelato! European Artisanal Gelato Day takes place simultaneously in many different countries, including Italy (of course! ), Austria, Belgium, France, Germany, Holland, Portugal, Czech Republic, the United Kingdom, Canada and Argentina. Check out our full regular menu, and be sure to stop by Red Rock Gelato Shoppe often to see what new and interesting seasonal flavors we’ve cooked up! 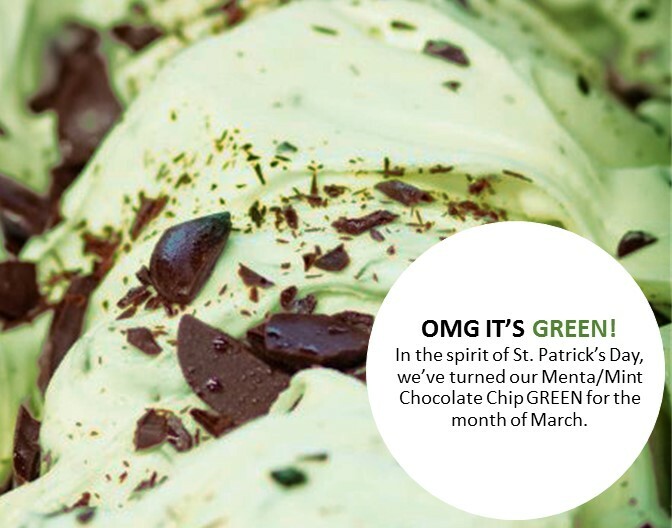 Normally, our Menta/Mint Chocolate chip is white, because we don’t add artificial coloring to jazz it up. But don’t worry – we’re using a natural bakery emulsion for the fun color. All its minty deliciousness is still intact, along with the yummy Guittard® premium dark chocolate chunks. We’ll keep it green most of the month in honor of St. Patrick’s Day. Soon after that, we’ll return it to it’s natural white color. Fear not — for you Caffè Gelato purists, we still have our original — handcrafted using a bold Arabica blend from Brazil. (I hear some of you are pairing this with our Fior di Latte/Sweet Cream gelato for more of a Caffè Latte flavor…) We’ve just split the batch and added dark chocolate chunks to half of it. And it seems to be a hit! Stop in and check it out! When we started thinking about opening Red Rock Gelato, we knew we wanted to have at least a few signature gelato flavors in addition to the more traditional gelato flavors on our regular menu. And we wanted something that paid homage to what we love most about Sedona — namely, the surrounding natural environment. Our signature gelato flavor is Strada Rocciosa Rossa, a.k.a. Red Rocky Road. We think it looks a little like the photo above — taken on the hiking trail to Devil’s Bridge — red rock base, with white rocks and golden trail dust. Our Red Rocky Road gelato starts with a proprietary red velvet gelato recipe. We then mix in Guittard® premium white chocolate chunks and graham cracker “dust”. It may resemble a hiking trail, but it tastes divine! Come in a give it a try — we think it just may become your new favorite! We look forward to seeing you in the Shoppe during the holidays! Be aware that we are closing a little early on Christmas Eve, and opening a little later on Christmas Day; New Years Eve and Day we’re open regular hours! ENTER OUR HOLIDAY SELFIE CONTEST! 1 - Dress up in your holiday best, worst or silliest. 2 - Take photos of yourself in our Shoppe with a bowl of our amazing gelato or sorbetto. 3 - Post the photos on your Instagram account using #RedRockGelato. There is no limit to the number of photos you can post! 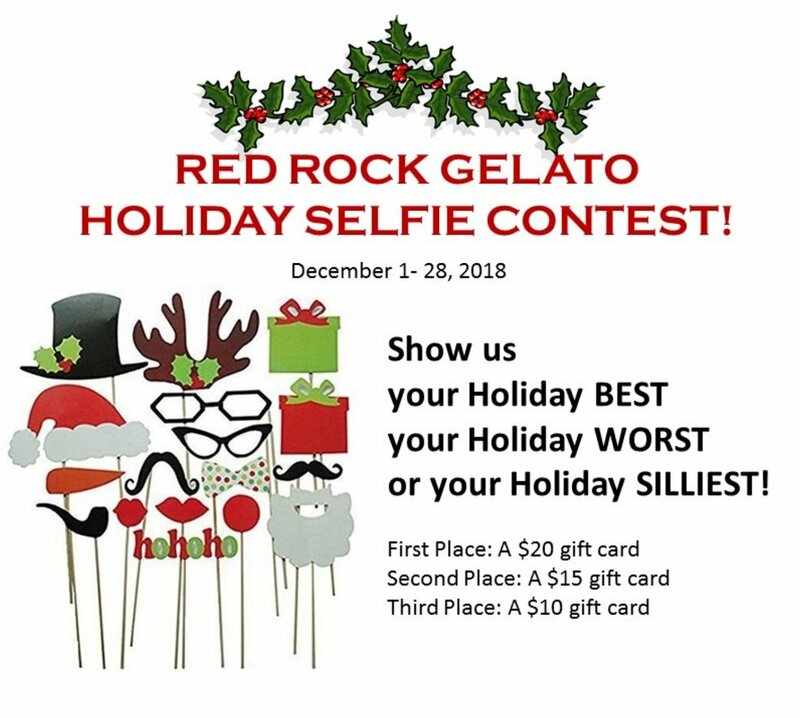 Three winners will be chosen by Red Rock Gelato staff and announced on December 30. Get clicking! You're invited Tuesday, October 30, 2018 from 3–3:30 pm. We’re excited to announce that the Sedona Chamber of Commerce and Tourism Bureau will be conducting a Ribbon Cutting Ceremony to celebrate the opening of Red Rock Gelato! The event will take place from 3–3:30 pm on Tuesday, October 30, 2018 and is open to the public. Sedona Mayor Sandy Moriarty is expected to attend. Red Rock Gelato is not a franchise; this is the very first (but hopefully not the last!) Red Rock Gelato Shoppe ever. We started this business from scratch — just like we start our Italian-style gelato and vegan-friendly sorbetto recipes from scratch! We had considered Uptown for our first location, but decided West Sedona would allow us to bring our premium product closer to our local community. Ultimately, we hope Red Rock Gelato Shoppe will be the go-to frozen dessert place for all our neighbors in Sedona and the surrounding Verde Valley. If you haven’t been in the Shoppe recently, be sure to stop by and check out our new flavors — a few Halloween flavors as well as cookie butter gelato and peach sorbetto. COME CELEBRATE GELATO AT OUR GRAND OPENING PARTY! You're invited to our Grand Opening Celebration on Saturday, September 15 from 11 a.m. to 3 p.m at our West Sedona location in the Harkins Theater Plaza. ­ The first 25 people in the door get a free T-shirt or hat. ­ The 89th person to buy a gelato or sorbetto will receive a special prize. ­ We’ll be raffling off additional hats and shirts throughout the event. ­ We’re offering FREE upgrades during the event — a small cup for the price of a mini, a medium cup for the price of a small, etc. Come taste for yourself how good made-from-scratch artisan gelato and vegan-friendly sorbetto can be! Much like a painter experiments with different brushes, choosing the right tools for gelato-making takes time and experimentation. It took us a lo-o-ong time to find our secret combination of equipment and ingredients to make Red Rock Gelato so special! So, when our Bravo Trittico gelato machine arrived straight from Italy, our good friend and equipment rep Tom Graves of Equipment and Concepts in San Clemente, California, came to the Shoppe to help Master Gelatiere Carl set up and take our baby on a test drive. Tom and Carl spend the day in “Mad Scientist” mode, warming up our new equipment and crafting some cool flavors, including Caffè (Coffee), Fragola (Strawberry) and an unusual concoction of beets, red cabbage and sauerkraut, which our taste testers confirmed turned out surprisingly delicious! Bravo, Tom and Carl! Bravo! Some say that a gelatiere’s chocolate gelato is the test of their skill and quality ¾ and we couldn’t agree more! That’s why we chose Guittard Premium Chocolate for all of our chocolate flavors. We’d never feed you something that’s less than the best, and since Guittard is known as the “Chocolate For Experts,” we knew we were on to something. Five generations of Guittard family members have dedicated themselves to pursuing the “artistry, craft and innovation of chocolate making” with a “complete obsession with making a premium chocolate that delivers a spectrum of flavor for a variety of applications” ¾ including our artisan gelato! Our Master Gelatiere, Carl, crafts his recipes using Guittard chocolates as a main ingredient in such flavors as Cioccolato (chocolate gelato and sorbetto), Gianduia (dark chocolate-hazelnut), Menta al Cioccolato (mint chocolate chip) and the chocolatiest of chocolates, Doppio Cioccolato (double chocolate!). Check out our menu for our full flavor board and stop in to see what new seasonal flavors–they’re always changing!